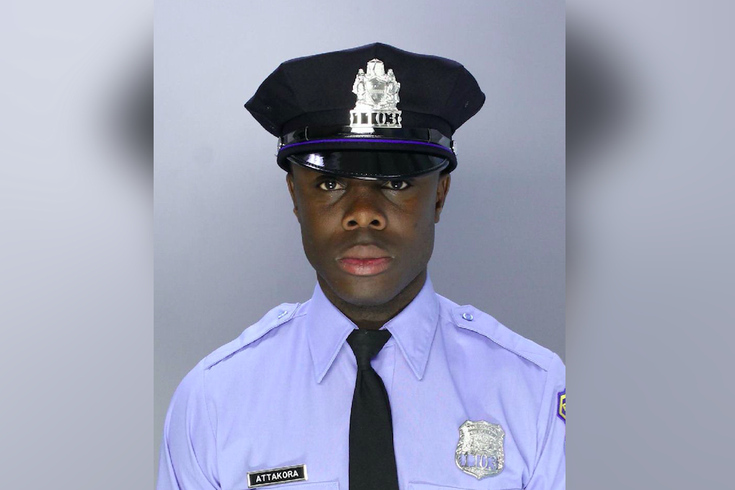 Philadelphia Police Officer Fred Attakora, a three-year veteran in the city's 12th District, was shot while off-duty on July 4, 2018. Philadelphia police are investigating a double-shooting on Independence Day that left one man dead and critically injured an officer who was off-duty at the time. Investigators said the incident occurred around 10:10 p.m. Wednesday along the 7000 block of Buist Avenue in the Elmwood section of Southwest Philadelphia, where neighbors were celebrating the holiday with a block party. Responding officers arrived at the scene to find a 24-year-old man suffering a gunshot wound to the chest. He was transported to Penn-Presbyterian Medical Center where he died of his injures. He was identified as Michael Boateng, of the 3000 block of South 72nd Street. The second shooting victim, identified as Philadelphia Police Officer Fred Attakora, 38, was found with gunshot wounds to arm and abdomen. The three-year veteran of the 12th District also was taken to Penn Presbyterian Medical Center and listed in critical but stable condition. Authorities have not yet identified a suspect or a motive in the shooting, but said Boateng and Attakora were not intended targets. An investigation by the homicide unit remains ongoing. Anyone with tips or information can call Philadelphia police at 215-686-3334 or 215-686-TIPS.